G.I.R. Garusinghe -Wellawaya Special Corr. State Minister Ajith Mannapperuma speaks to the media during the field visit. 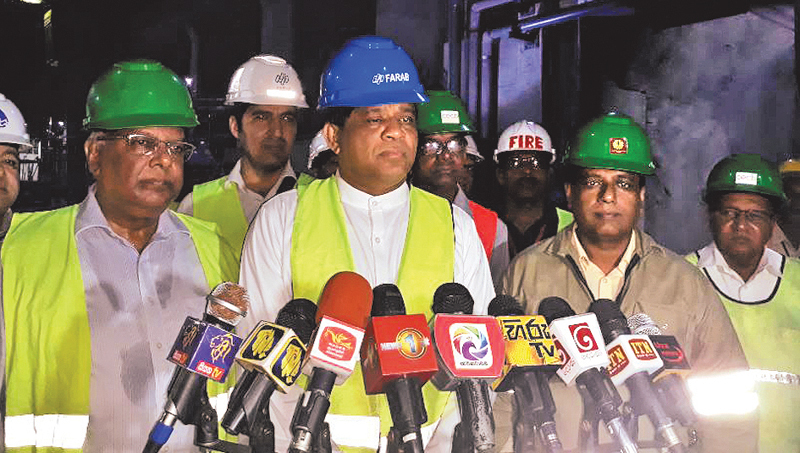 The Uma Oya underground hydropower complex will most probably be the last hydropower station in the country, State Mahaweli Development and Environment Minister Ajith Mannapperuma said yesterday. The State Minister was speaking to the media during a field visit to the Uma Oya Multipurpose project. The Uma Oya hydropower complex will add 120 MW to the National Grid by August this year. Further, the hydropower complex will provide 290 million units to the National Grid within a year, he said. “This water will be used to cultivate around 6,000 acres in Moneragala. When we purchase electricity, we have to pay Rs. 28 to Rs. 30 per unit, whereas when we generate power by this method, it costs us only Rs 3.50 to Rs. 4.00 per kilowatt. Considering our capacities, this power plant might be the last of its kind,” State Minister Mannapperuma said. Uma Oya Multipurpose Project Director Dr. Sunil De Silva and other high-ranking officials were also present.